Aquaclean Showroom Finish Car Polish is the ultimate in high gloss car polish. It is easy & quick to apply, allows a car to be polished from front to back in around 20 minutes. 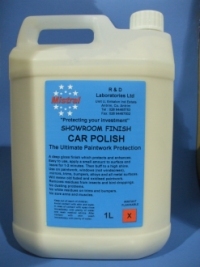 Specially formulated without the need for powders it eliminates the problems of white bumpers and trims normally associated with conventional polishes. In fact it was designed to be used on all external surfaces - paintwork, bumpers, trims, glass, chrome, plastic, etc. You will be amazed, not only, at the depth of shine but also how long it lasts. Contains a blend of special silicones and carnauba wax. Polishing should be painless, so no more sore arms & muscles. No more... having to apply & leave for 1 hour, then buff off, no more having to remove the white resides left on the trims. Simply apply to a panel, spread evenly, leave for a few seconds & polish to a high shine.